I hadn’t planned to go to Belfast. After the glorious weather at the Carlingford Festival in February 2015 (check blog here) I decided to head up to the Glens of Antrim in Northern Ireland but, as I travelled up the motorway, the mist set in and it seemed rather pointless, as I was hoping to do some photography, so I diverted into the city. 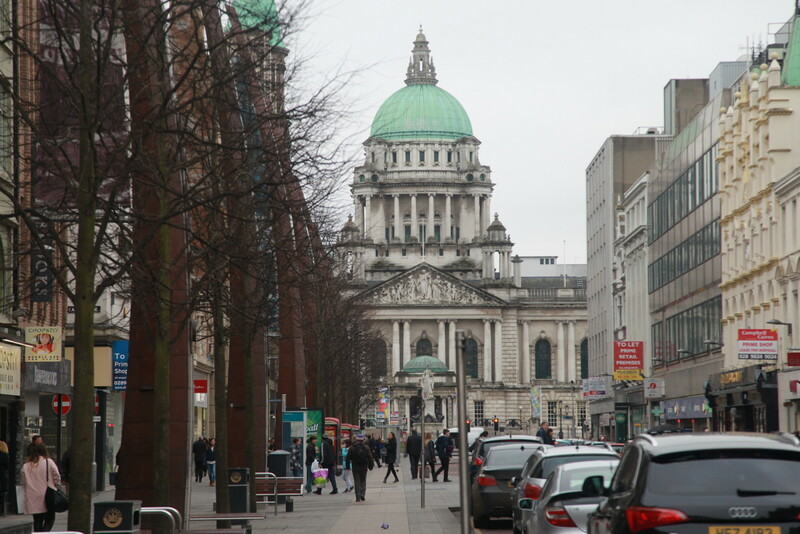 I had never been to Belfast. 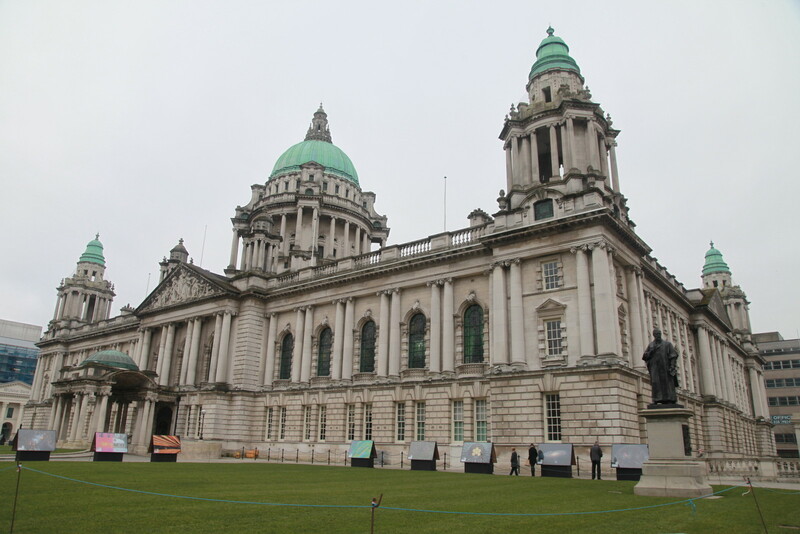 On my first visit to Ireland in the mid-90s we had given Belfast a wide berth. Travel warnings and all it wasn’t considered safe then. This time I drove into the city with no plans and virtually no knowledge. I stopped at the first hotel I found, which happened to be Jurys and they had a special rate – not that much pricier than a B&B. It was right in the centre of town and within walking distance of all the major attractions including the session bars. So that was lucky. Before I had even entered the lobby of the hotel I became best friends with Bobby who it turned out runs a taxi guided tour and before I knew it I had agreed to go with him. So without even finding my bearings I ended up in the back of the Belfast version of a London cab. This turned out to be an inspired choice. He called it a ‘political’ tour and despite his ‘green’ (as distinct from ‘orange’) credentials, which came through occasionally, it was presented in a dispassionate way with both sides of the argument presented as we visited both the Catholic and Protestant hot spots. I learnt a lot, given that most of what I knew was picked up on Australian television via the ABC or BBC (and presumably ‘managed’ so not necessarily reflecting reality). Even so I back then I had been detached from it and it is surprising how being there on Falls Road or seeing the Wall or the memorial garden or the segregated living areas puts it all in context. Not being Irish I don’t think I will ever fully understand it but Bobby was able to give me a lot of the background. We drove up Falls Road where the murals depict episodes important to the Republican struggle. I got detailed explanations of each of these including the gassing of Long Kesh, the dirty protest which turned into the hunger strike at Maze Prison, the rights of travellers, The Titanic “built by Irishmen and sunk by an Englishman”, the killings at Ballymurphy, the Falls Road taxi killings, the Gibraltar Killings and the Milltown massacre. We visited the Sinn Fein office in Sevastopol Street with the famed mural of Bobby Sands. He died in 1981 after 66 days on hunger strike and his story still causes rancour with many. His legacy remains however and he is credited with inspiring a new generation to take up the Irish language, something that Sands and his fellow prisoners did in the tortuous conditions of H Block. Particularly moving also was a visit to the Clonard Martyrs Memorial Garden. This is a very simple walled space located at the spot where the troubles really kicked off with the burning of catholic houses. A few hanging pots and some benches in a paved area allow quiet contemplation. 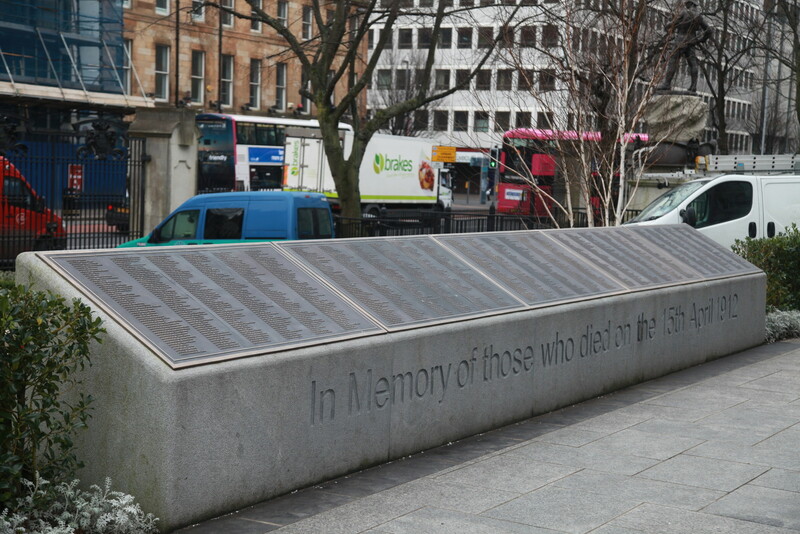 The names of victims of the Struggle are listed on plaques and there are images of some of the fallen. What struck me was the extraordinary youth of many of the dead. Most in their 20s and 30s but some as young as 16. The memorial is adjacent to the dividing wall which looms overhead and the houses backing up against the wall have cages which used to protect them against grenades and other objects lobbed over the fence before the Peace deal. On the protestant side I signed the Wall, along with thousands of others, with a felt pen thoughtfully provided by Bobby. This seems to have become something of a ritual and names and messages from all over the world are dotted among the graffiti. We visited Shankill, an exclusively Protestant area where I walked around the incredibly quiet streets. Presumably everyone was at work or school but the place seemed deserted. Murals on the end walls of rows of tenement houses are a feature and these depict events significant from the Union side. There are recent murals celebrating individuals such as Stevie ‘Topgun’ McKeag who died in 2000 and is credited with a dozen killings, and William Bucky McCullough who became a martyr after being killed in an internal dispute in the UDA. There is another celebrating the formation of the Ulster Defence Union in 1893 and the Ulster Defence Association in 1972. For reasons unknown to me there is one depicting the Bloody Battle of 1809 in which Napoleon secured victory over the Austrians, More obviously there is one remembering the founding of Belfast in 1609 and others celebrating legendary hero and defender of Ulster, Cuchulainn, and a somewhat gory depiction of the Red Hand of Ulster among many others. Houses here proudly fly the Union Jack. The tour was good value and highlighted to me the many injustices and the essential futility of it all. The song ‘There were Roses’ was going around in my head. It also made me reflect on the extraordinary achievement of Peace in Northern Ireland after so long. The protracted negotiations through the 90s that led to the Good Friday Agreement in 1998, the subsequent massive endorsement at the referenda in both the North and the Republic, the decommissioning of the IRA’s weapons in 2005 and the ultimate end of the Process with the elections of 2007. Many however appear to hold on to their part in the Struggle. There is massive progress but I think there is still a lot of work to be done with 93% of kids in Northern Ireland going to segregated Catholic or Protestant schools. By now I had my bearings and in the evening I continued my unguided walk and found myself at the Crown. A truly extraordinary bar. I have seen nothing like it. It is owned now by the National Trust. 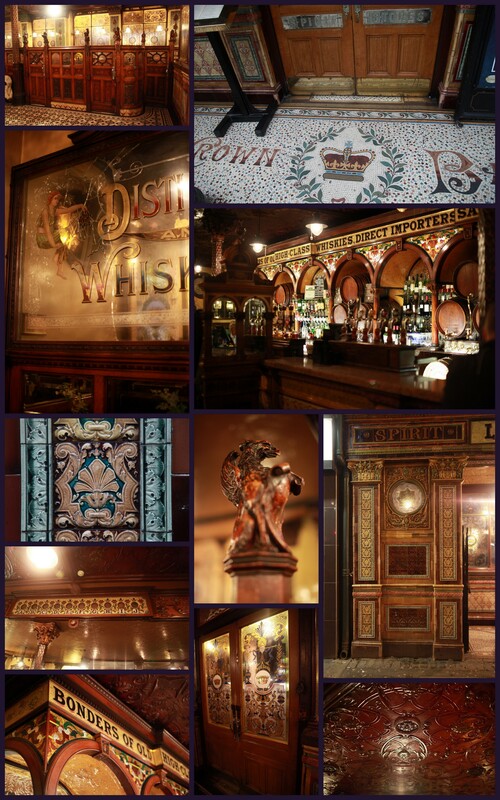 The bar was renovated in its current form in 1885 by Michael and Patrick Flanigan and then restored in 1980 and again in 2007. Things that drew my attention include the amazing tiled façade and stained glass windows, a massive granite topped bar with heated footrest, ten snugs with a bell system so ladies could call for their drinks without going out, plates to strike matches, a mirror damaged by a bomb blast and since restored, a wonderful mosaic at the front door showing a crown (said to have been installed there so patrons could walk all over the crown!) and incredible carved woodwork finials, a magnificent ceiling. I could go on and on. Just marvellous. I had a very enjoyable lamb shank pie there (and a Guinness of course) and indeed went back there for every meal. 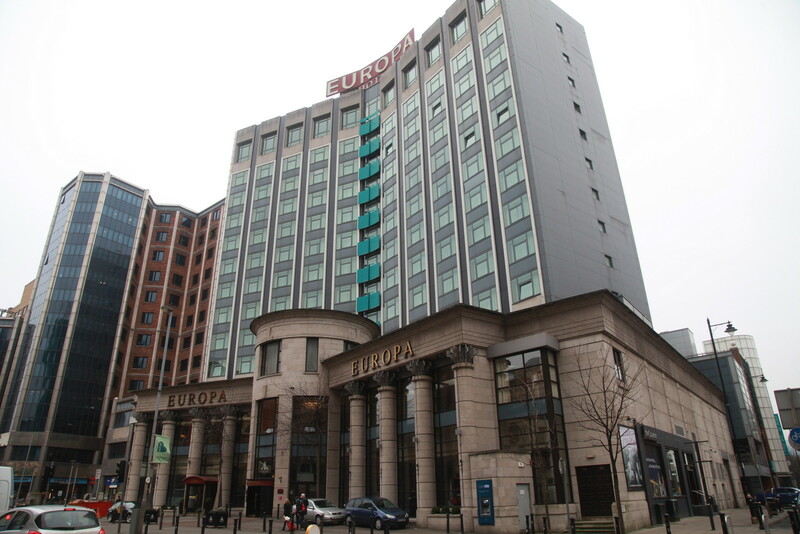 Opposite the Crown is the Europa Hotel. 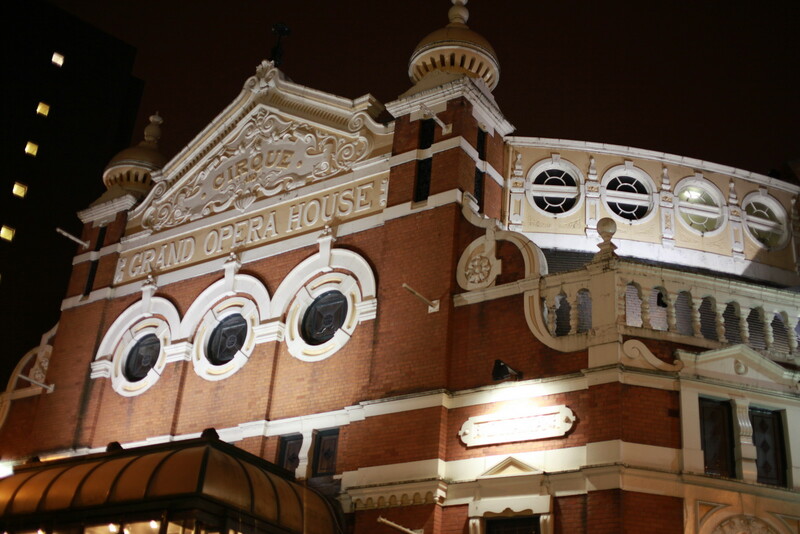 During the Troubles it was damaged 33 times by IRA bombs including one massive explosion which wounded 20, punched a hole in the side of the adjacent Grand Opera House, shattered virtually every window in the Hotel and caused extensive damage over a wide area of the city center. 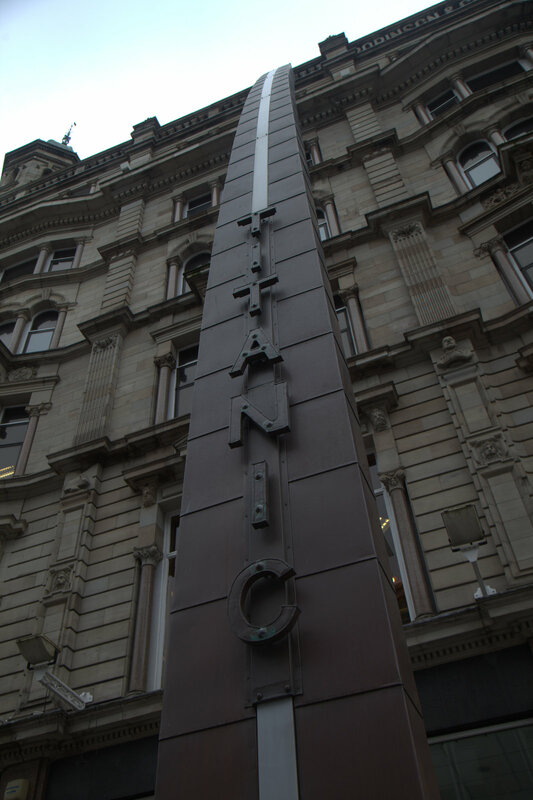 The city itself is full of remarkable architecture and is great to just walk around and soak up. 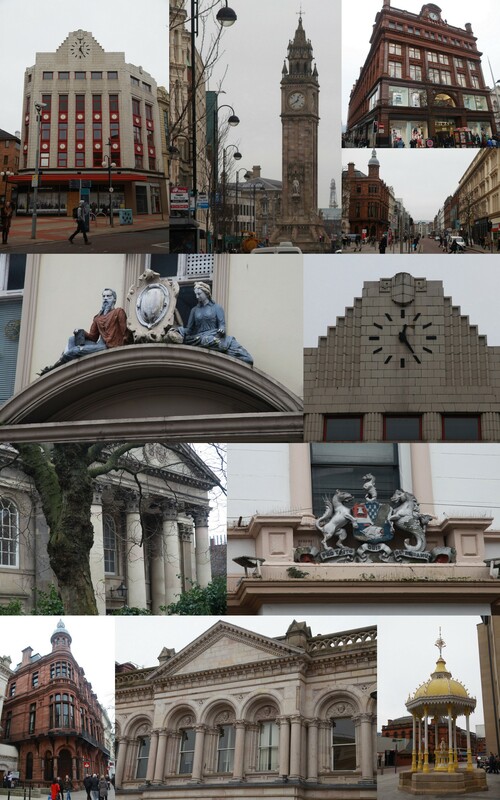 Many of the buildings date from Victorian times and reflect the wealth brought to Belfast by the ship building and engineering industries and the linen and tobacco trades. This includes the outrageously ostentatious City Hall built in 1906. This building was considered more befitting of the City’s status than the previous modest building. It cost £396,000 to build, an enormous sum, perhaps the equivalent of £150 million today. It was funded by two years’ profits from the City’s gasworks! I did not go inside; but having read about it later I have put that on the list for my next trip. 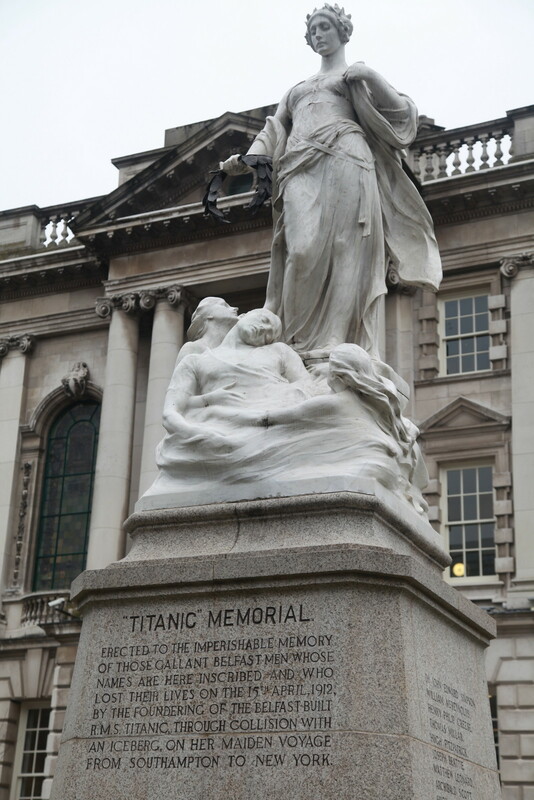 Many statues dot the gardens including a memorial to the Titanic which includes the names of all those lost. 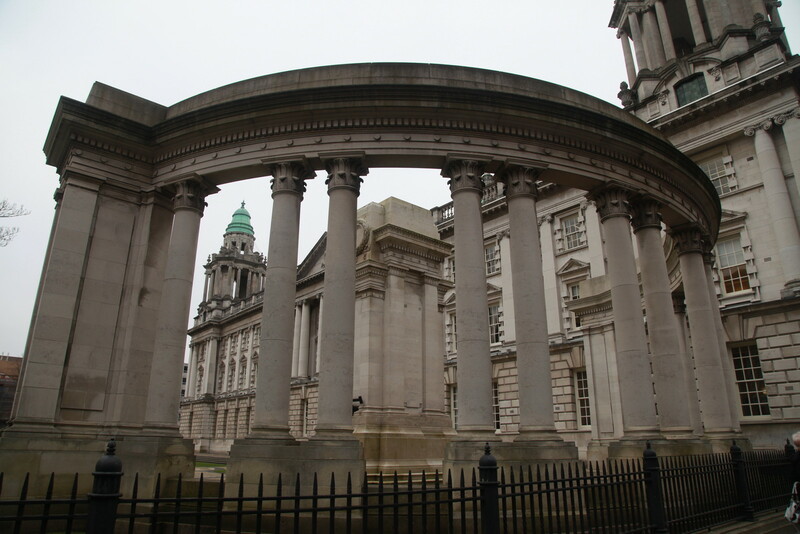 The City Hall lies at the end of Donegall Place one of the main thoroughfares, Along one side of this avenue are a series of sculptures of uniform design reminiscent of a sail, depicting the great ships built in Belfast. Included of course is the Titanic, the largest ship ever built at the time and which was sunk on its maiden voyage in 1912. It figures greatly in the psyche of the city and is a major attraction to visitors. Many other fine buildings grace the wide streets. For the keen observer there are many delights to be had. Largely pedestrianized in its city centre it felt relaxed and uncrowded. The people were chatty and friendly. I ended up playing some tunes on a Romanian version of a Stroh viol offered to me by a busker. 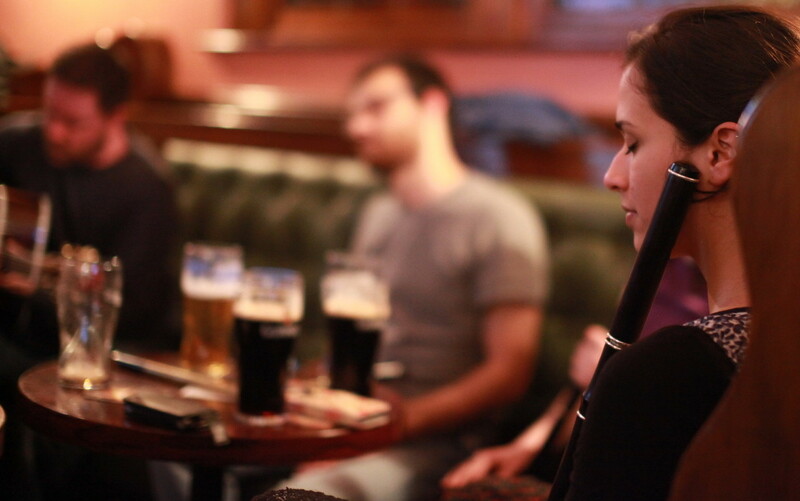 My playing was well received and led to the crowd cajoling the busker to play some Irish stuff instead of Romanian folk tunes; good craic. Musically my experience was mixed. My timing wasn’t good and the session at Maddens on Monday was definitely not my cup of tea. It reminded me of that Maori anthem of the 60s – ‘Ten Guitars’ because, no exaggeration, that’s what we had, along with a harp a couple of banjos and a fiddle. 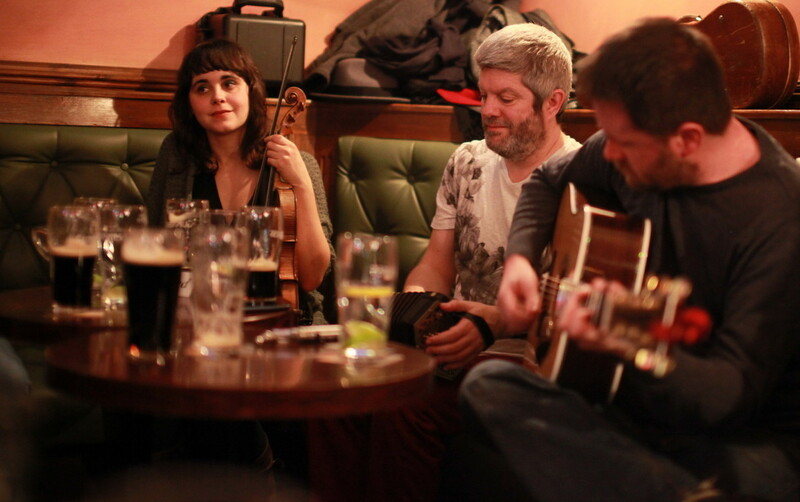 It was all songs and while the craic was good it was not for me. 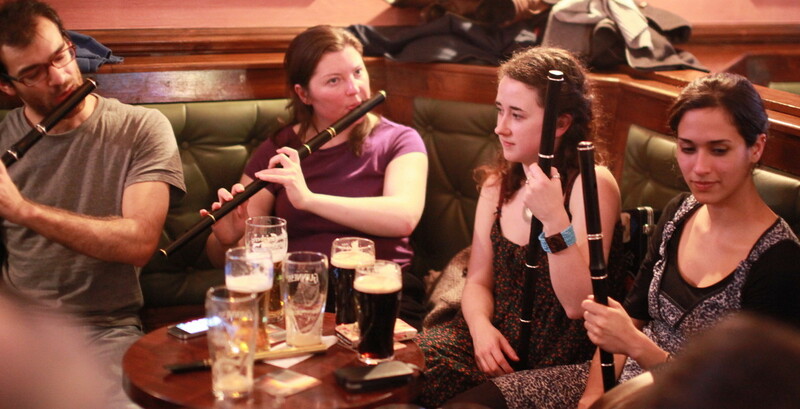 Then next night I heard it was ‘real’ trad at Errigle Inn, a little bit out of town. So a short taxi ride there and immediately I saw I wouldn’t be disappointed. Great music, great craic and some familiar faces from my festival travels. This went a long way to supporting what I had been told that Belfast had some of the best traditional music in Ireland at the moment. It was fast and enthusiastic and inclusive; a fine way to end my short stay. When I visit a city I rarely go to the tourist hot spots. I walk around and try and soak up the atmosphere. So I can’t tell you about galleries, museums or the Titanic Experience. I’m sure they are brilliant and there are plenty of places you can get that information. 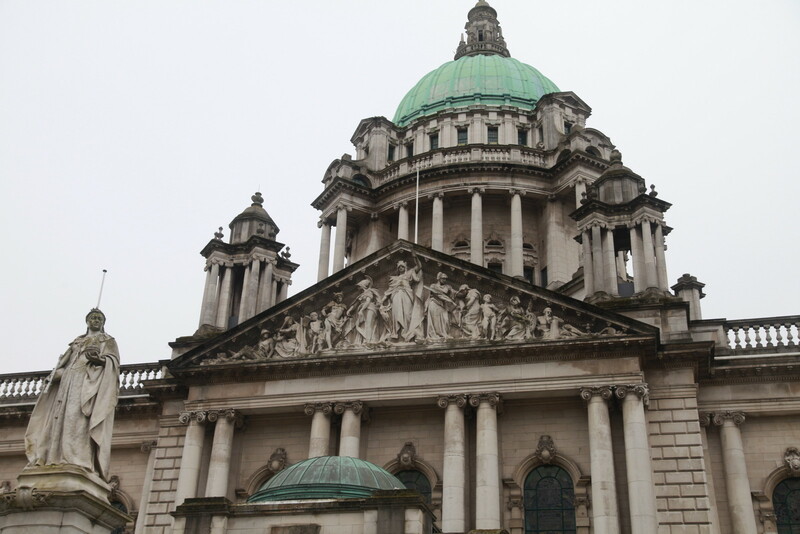 But I really enjoyed Belfast. The rich history both old and very recent, the great architecture, surprisingly friendly people and most importantly for me, good music if you look, make it a top spot to visit. I’ll certainly be back. I am soon to set off on a road trip to discover parts of Ireland I’ve yet to see. 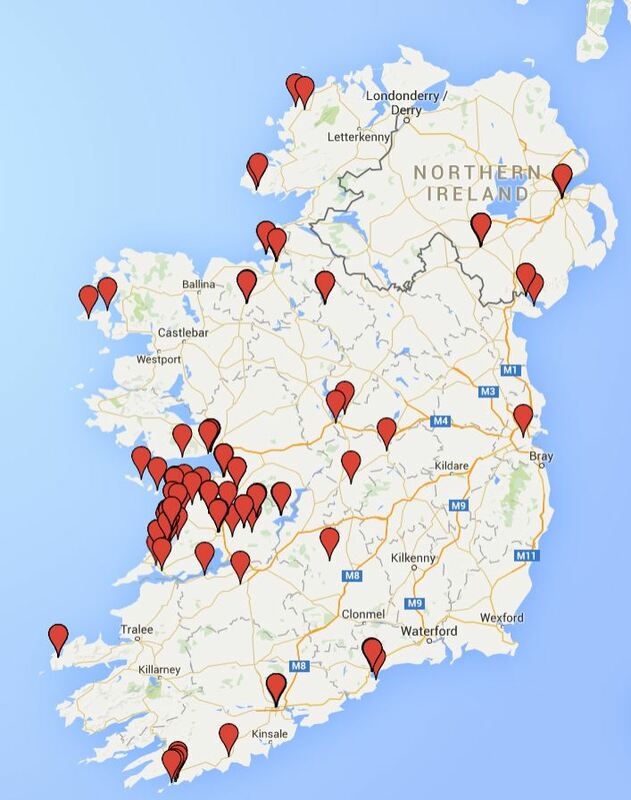 I’m looking for suggestions of places in Ireland that you think I should visit or that you would like to see me blog on. Just respond in the comments to this blog. That’s all. One of the city app prizes to the first 20. Oh and don’t forget to nominate the city you wish to receive the free app for. Another calendar year on my Irish adventure has ended. And as I look forward to the next 12 months it is also a good time to look back. Although hamstrung for the last four months due to my visa and driving licence problems I have still managed to take in an enormous amount of music. 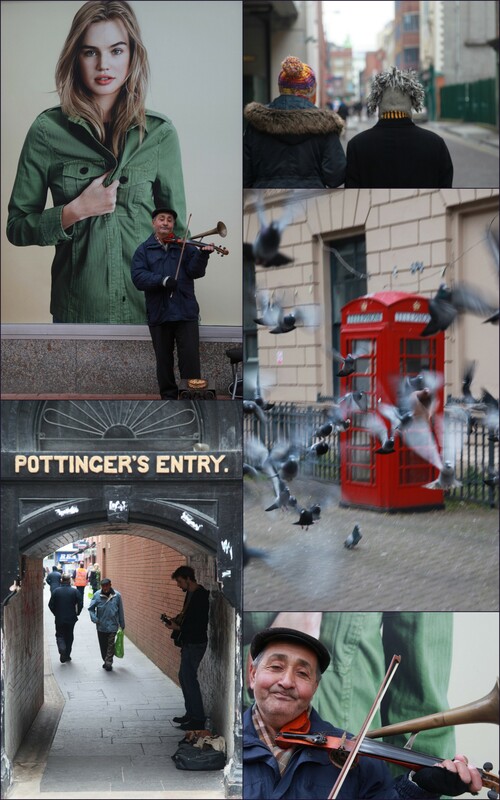 I posted a collage the other day on Facebook with a selection of my photos of musicians from the past year. I thought I would repost it here for my blog followers who are not on Facebook. These are people I saw in concert or played with in sessions. To many of my readers there will be a lot of familiar faces and I got great joy from seeing and playing with them as I did with the lesser known but often equally talented musicians I came across every day. I thought it would also be an interesting exercise to plot the locations of the pubs where I have played in sessions since I have been here. Unfortunately a few have escaped my memory but the accompanying map shows 144 pubs. Not a bad sample. I surprised myself with the spread across Ireland but also with the gaps. I still have plenty of Ireland to discover. 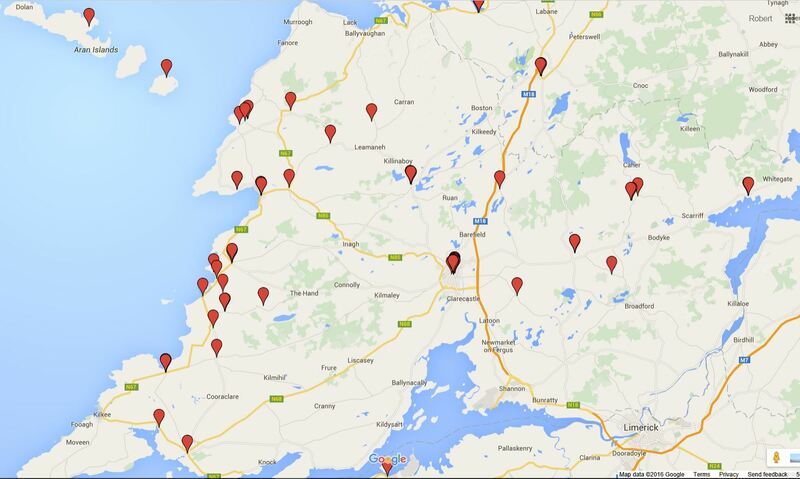 What hits the eye though is the obvious concentration in County Clare. This is of course partly an artefact given that I live in Clare and visit a pub every night but it is also a reflection of the reality that there is music everywhere in the county. In the tiniest village or the largest towns. I didn’t see this elsewhere. If you look closer though it is West and North Clare. Session pubs are thin on the ground in East Clare. 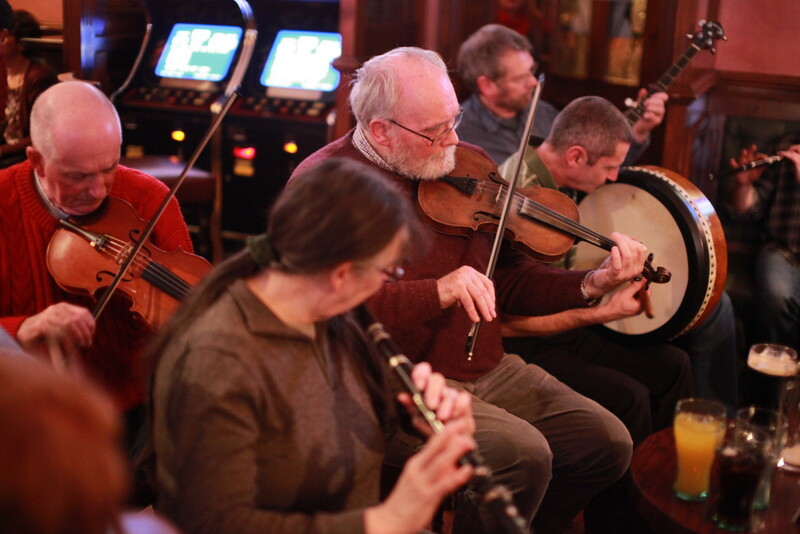 If its music you want come to Clare. where you can zoom in and see the names of the pubs. I would like to take the opportunity to wish all my followers a Happy New Year and may it be filled with new experiences, new joys and new music.